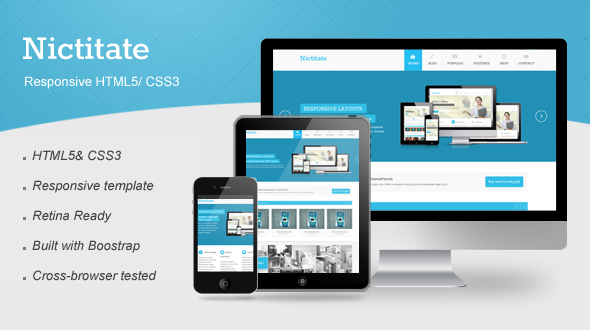 Nictitate theme is a multi-purpose responsive HTML5 template which could be used for almost all kinds of business. With its stunning design, amazingly comfy layout you will get the most satisfied customers ever. Nictitate is fully responsive and amazingly clean. It will display well on desktop screen, smartphones – and of course any Tablet or iPad. It looks awsome on any device! Theme come with two optional versions – Wide and Boxed. Using boxed layout you can fill in website background with any pattern or image you like. In working day (from Monday to Friday), all the question or problem related to our product will be responded within maximum 24 hours. No matter how long it takes, we will support you until the problem is completely fixed. Support request sent during weekends will be processed on next Monday morning. The above demo images are copyrighted to their respective owners under Creative Commons-licensed for commercial use, adaptation, modification or building upon. The images are used for demo purpose and are NOT included with the download.